The 2.8% drop over the last six months is nothing but a flesh wound – sellers aren’t going to panic until there are big chunks of decline per month. The previous peak was 250.34 in November, 2005 – about where we are today! 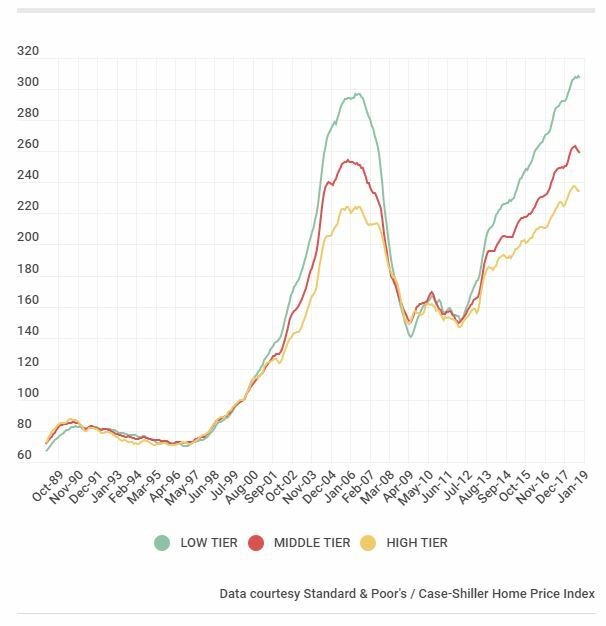 San Diego Case-Shiller Index, Dec.
We are back to more-normal appreciation levels now. After dropping for the last six months in a row, the non-seasonally-adjusted Case-Shiller Index for San Diego is just +2.3% year-over-year. In the graph above, you can see how the index goes up about ten points in the first half of every year, but then pricing tapers off. Last year, the tapering started earlier, and was more pronounced. It makes you wonder what will happen in 2019? The same? Or worse? It won’t be better unless mortgage rates slip under 4%. 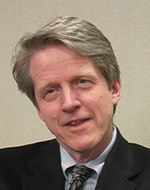 The previous peak was 250.34 in November, 2005 – about where we are today! If you like your data processed and refined, the seasonally-adjusted index has been flat the last four months. I like mine raw and uncooked. They revise these numbers slightly every month. We are roughly back to where we were in March. You could make the case that the better-quality homes sell for a premium during the selling season while the others wait, and then some of those go for a slight discount in the off-season. It might be the pattern for every year, going forward. The previous peak was 250.34 in November, 2005. No surprise the trend shows the higher the price, the softer the price increases. The lower-end market keeps humming along, while the higher-end market isn’t – and the connection between the two is getting fuzzier by the day. With the struggle of moving up or down being very real, we could see more disconnect between markets. Let’s keep this in mind when analyzing trends – it’s more complex than ever. The San Diego Case-Shiller Index dropped for the fourth month in a row, and was about the same as it was in April. We will probably keep heading downward for the next few months, but at least the latest reading wasn’t as bad as the last two months – only down 0.1%! We will probably lose another 1% or 2% between now and Spring, 2019, which would put the index back to about where it was in February. What happens in next year’s selling season will be the real test. The San Diego Case-Shiller Index dropped for the third month in a row, and is now almost 1% below where it was in June. It’s not a surprise to hear that we have tougher sledding in the off-season (see above). 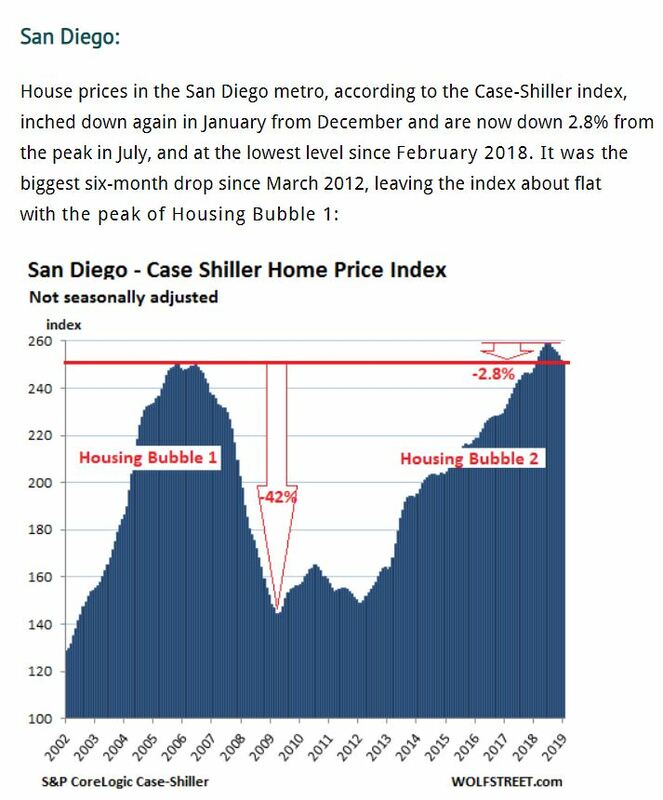 The San Diego Case-Shiller Index has begun its usual flatness a little earlier this year, and we might see it drop a couple of points in the coming months. But never fear, Blitzy is here! As expected, the June and July numbers were revised, making the August reading the second consecutive MoM decline. Usual Seasonal Change, or Panic Time? Rob Dawg predicted it that any and all appreciation will happen in the first half of the year – and if we’re just talking about the general trends in local San Diego pricing, that’s how it has been lately. 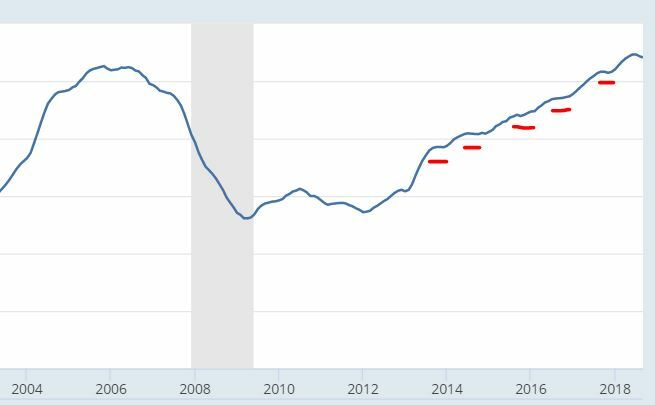 As the red circles show in the graph above, the non-seasonally-adjusted SD Case-Shiller Index has a history of cooling off in the second half of the year. Will the same seasonal event happen again in 2018? Most likely – our June and July index numbers were the same this year, so it’s likely to stay flat, or even soften a bit like last year. But were talking fractions, not big chunks. The number of sales are another thing, however. Few sellers NEED to sell, so while buyers might offer less, it takes two to tango. “Offers 20 percent and 25 percent below asking prices began to flow in, a phenomenon last seen in 2009,” wrote Warburg Realty founder and CEO Frederick W. Peters”. Sellers aren’t going for it. They might knock off a few points, but unless they are unusually desperate, they are going to sit on their presumed equity and wait until next year if they have to. Sales would have to grind to a halt for sellers to think about dumping on price. I know they aren’t closed yet, and at least one of those will probably fall out. My point? The market isn’t dead, or even sleeping – it’s just finding its way. Home prices are still rising, but the pace of the gains continues to slow, as potential homebuyers hit an affordability wall and sellers cave to the new reality. These get revised every month, so it’s likely that this July index will be lower than June the next time you see it on October 30th. The previous peak was 250.34 in November, 2005. We are 3% above that now. We can probably expect the SDCSI to cool down in the second half of the year, just like it did the last two years! Let’s note that in 4Q17, the cumulative change for the index was -0.1%.